SPECIAL OFFER! 20% off, only £103.27! Great product from Epson. Having Epson scanner before we kept with the same manufacturer. Easy set up and use.\r\nTradescanners made the purchase easy. Fantastic prices, communication, fast delivery. A great company to do business with and would recommend. 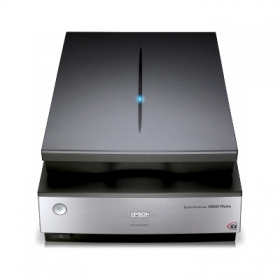 Convert all your treasured memories to digital using this professional-quality, 6400dpi scanner. The V800 requires virtually no warm up time and includes high-quality film holders to help deliver fast, high-quality results. For improved clarity, dust and scratches are automatically removed from film and photos. Digital ICE technologies automatically removes imperfections such as dust, hair, scratches and fingerprints from both film1 and photos to restore images to their former glory with the minimum of effort.